Imagine the poles of the celestial equator and the ecliptic as two cogs in a huge steam engine, the former fixed and the other revolving around it 3 minutes 56 seconds more quickly than once a day. Imagine a great piston attached to a crank on the ecliptic wheel axle driven in reciprocal motion on a track fixed to the horizon. That is the visible sector of the Zodiac. Several points spring to mind when I look at the location of the MC in relation to the zodiac.Knowing where North is reveals instantly where the stars are at their highest altitude. The intimate relations between my geography, my sky and my life are confirmed. However, if I don’t know where North is, and despite the fact that I am very familiar with the constellations and how the relative positions of their main stars change as their imaginary shapes roll across the sky, I find it very difficult to orientate myself to true North. If getting accurate bearings is my aim, I find true South and project the meridian back over my head. The highest zodiac constellation is not due North. It gives me a rough idea, which I can adjust if enough time elapses to indicate which stars are ascending and which are descending. If I am simply in a forest of stars which I am identifying, the Ascendant and Descendant are the East and West, and North is near enough to halfway between the two. The point is that the symbolism of the transit of stars, planets or signs can be derived mathematically—and how exciting it must have been to assist at the birth of coordinate geometry, the measurement of time and the practice of geodetics—but not from immediate experience. 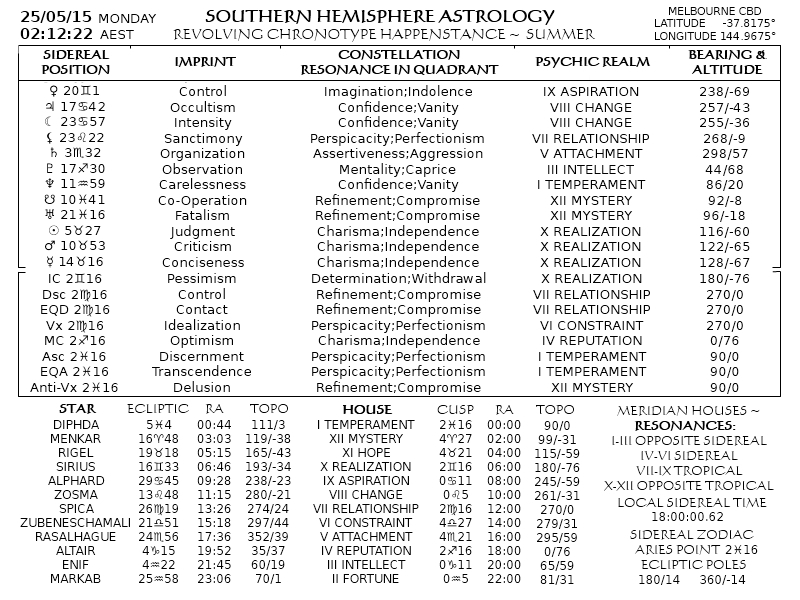 For my purpose, which is primarily to encourage you to experience the night sky for yourself, the MC, which according to my understanding of convention represents the direction of your mission in life, can primarily be symbolised by the highest visible or imaginable sector of the zodiac, and only secondarily related to the theoretical moment of its transit. Here is where it is, I say, and it is welling or subsiding, possibly ascending in the social quadrant or descending in the personal. Perhaps the quadrants should be established in the same way, for it is also problematic to directly establish the cardinal directions by observing the Sun’s transit. At the end of the day, as it were, I am happy to disturb convention, and to raise questions which resonate with direct experience and reconnect geometry and observation. 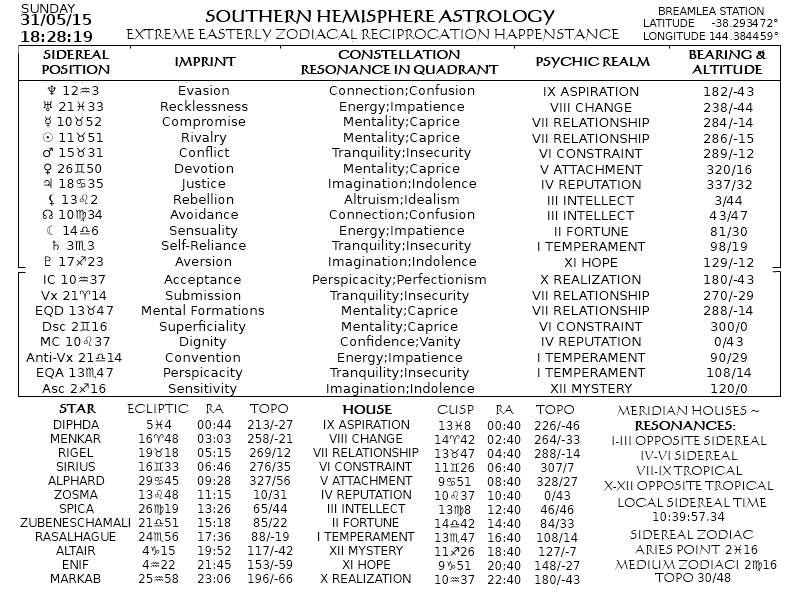 In this case, your navel-gazing might be enhanced by allowing the question, how will the orientation of your Medium Zodiaci to culmination influence the resolution of the opposition of your Ascendant and Descendant, in view of its square with both? There is a real feeling of sensitivity, of expectancy, almost apprehension, as though we have prepared for something we don’t know, but it’s momentous, and suddenly we are aware that whatever is coming is bigger than we are. 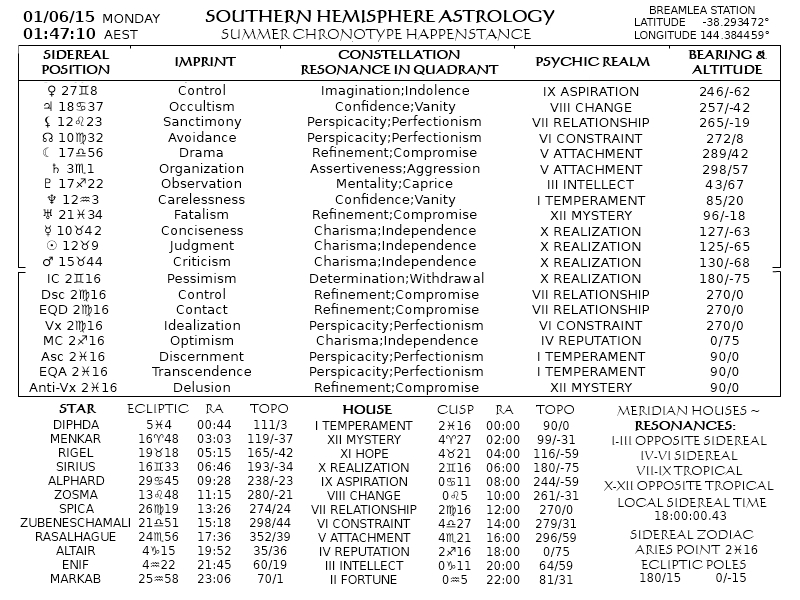 Some ruminations on the relations between the zodiac and the fixed stars. All bodies reach their highest altitude as they cross the meridian and unless they are circumpolar—obviously a body never sets if its distance from the celestial pole (90 minus declination) is less than the pole’s altitude (equal to local geographical latitude)—rise and set at the same angle east and west of the meridian. 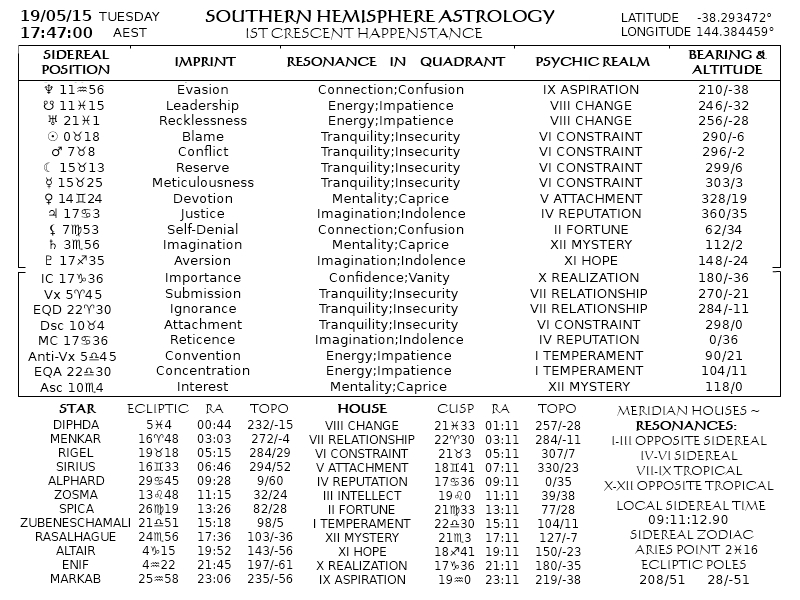 This means, always measuring from the north, that a star or planet sets at azimuth 360° minus its rising azimuth. 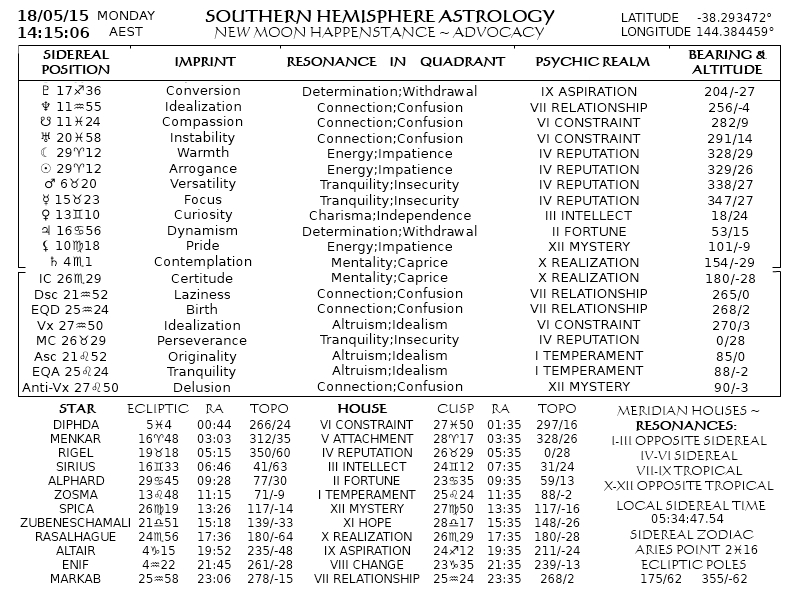 On the other hand, the angles of ascendant and descendant always differ by 180° regardless of declination. What’s going on there? All it means really is that half of the celestial background of Earth’s orbit is always above the horizon, but what is interesting is that the arc of the visible zodiac, unlike the arcs from rise to set of everything in it, is independent of north, i.e. the rising constellation at any moment will set the same distance from north, not over where its opposite constellation is now setting. If you stand under the night sky long enough and often enough you will witness the regular oscillation of the arc of the visible zodiac swinging left and right. 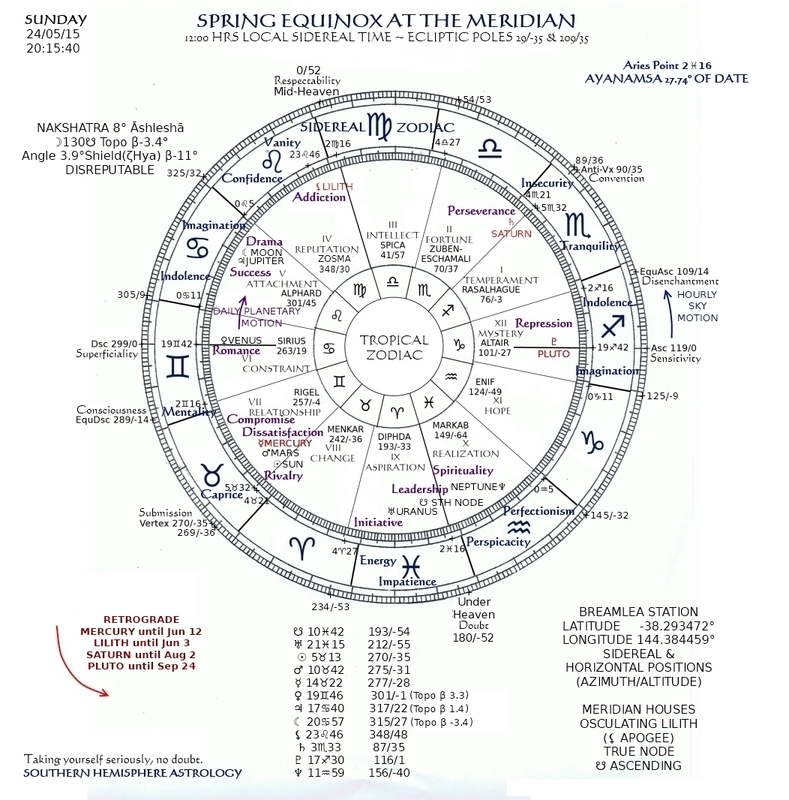 When Sagittarius or Gemini is at the meridian the zodiac is symmetrically positioned across the sky from 270° west to 90° east, but halfway through a 60° swing from one side of north to the other. 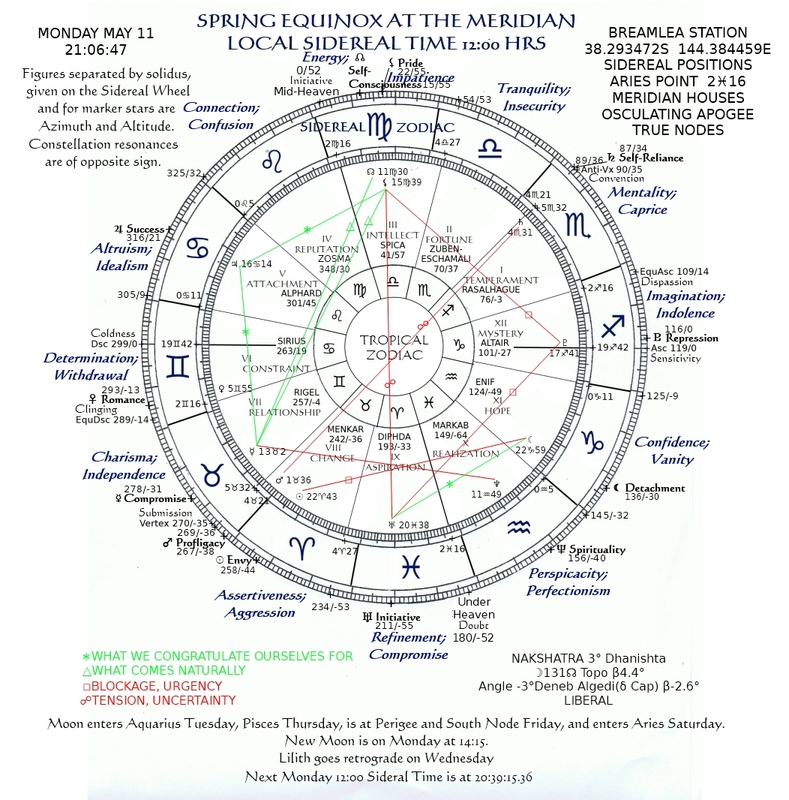 If you stretch your arms east and west when Virgo or Pisces is at the meridian you will have to twist 30° left or right respectively in order to reorientate to the centre of the zodiac. 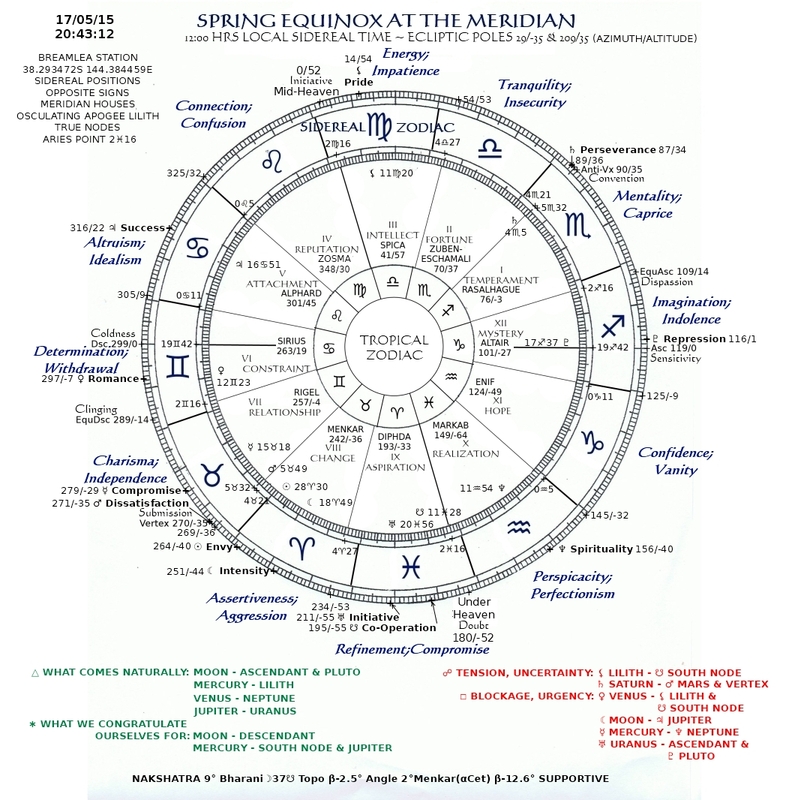 Finally, you will realise that the swing back the other way begins when Virgo or Pisces is at the centre of the zodiac, about an hour and twenty minutes before or after transit and about 20° east or west of the meridian. If every time you orientate in this way you will experience two norths, a centre of the astrological sky and a point often considerably off centre where the stars are reaching their highest altitude. When that point is to the right you may be aware of an imbalance to the west and imagine an attraction to the east and uplift, and when the stars of zodiac centre are still rising you may feel too much of your focus directed east and be drawn westward towards the downside. 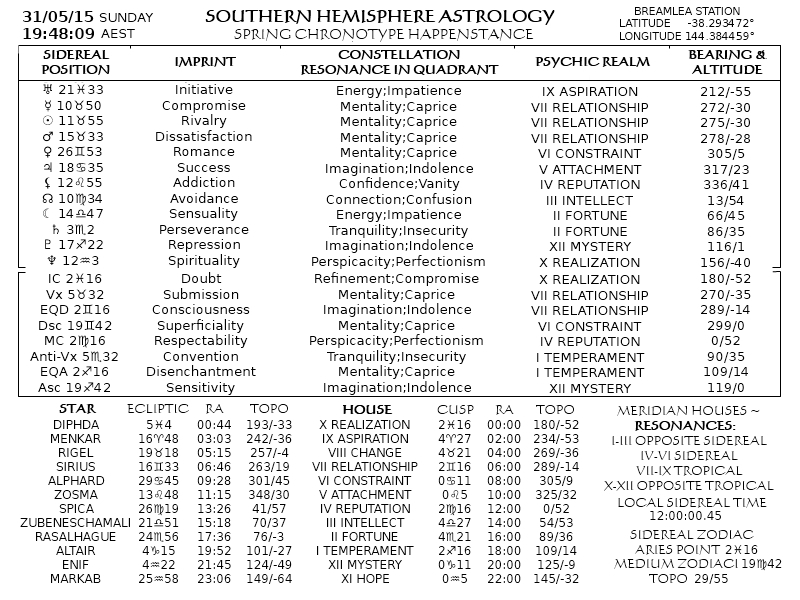 There is a connection here with how I arrange the houses and the resonances of the constellations. The western hemisphere contains the houses of social interaction and influence by the discrimination of others both conscious and unconscious. 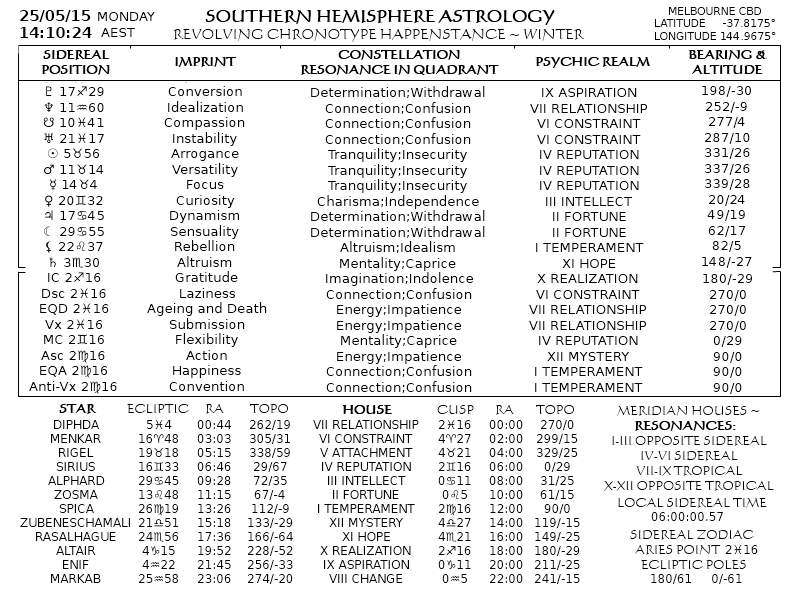 When a constellation is in the west, it carries the symbol or sign given it in the northern hemisphere, reminding us that like all structures, schools of ontology and cosmology, including astrology, are the solidified byproduct of once vital energy, and the confirmation of bias. Let the denizens of the old country argue sidereal vs tropical. We have bigger fish to fry. What? The personal hemisphere of the east is what. This is where we inhabit our environment, nobody else’s, and that is of course impossible, but where we learn in our own way from our mistakes and piss off those who piss us off, a time and place for obsession, self-absorption and self-fulfilling script-writing—where we judge lest we be judged. Here we say the first thing that comes to mind—or nothing at all—and devil take the hindmost. We affect individuality, but are largely oblivious to the patents on our behaviour. Go within and have another look, is the echo of the western hemisphere here, in order to engage with now and move authentically forward—responsible for your image but not believing a word of it. If this sounds like the self-indulgent raving of a recluse on a Friday night, there is a reason, and I hope you are as empty of delusion as you demand of others. Fat chance, but hey, who’s to say? It’s difficult to pick somebody out who is on the straight and narrow. The Moon acknowledges stiff resistance, and it would appear he can expect no assistance from the Bench, who smiles amiably at the ignorant people of the Law. He tries eloquence to no avail, because the universe seems to all and sundry to need no explanation which hasn’t already been provided by upside-down experts. He has been here before, looking beyond the Sun, with an obtrusive Earth to reckon with. The Dark Side is down to half-illumination. The Sun made this sound easy. As I keep repeating, my horoscopes are for unpicking confirmation bias, and rather than replacing one system with another, for providing a tool, almost a random keyword generator, which can help to reveal the emptiness at the heart of confirmation bias. I recognise in the keywords used by contemporary self-help modules, in particular the terms ‘presence’ and ‘mindfulness’, a promise that fear, anxiety and despair can be eliminated by transcending a limited experience of self. What I am witnessing is not a transcendence of self, but a narcissistic inflation of self, an expansion of personality which looks like an embrace of otherness but seems rather a deluded entrenchment of infantile defences against failure, loss and finitude. See if you can find symptoms of these defences as you focus self-awareness on the keywords presented by the horoscopes which follow. Let’s make no bones about it: we do fail, we do lose, and we do, after a very short time, die! We need help to deal with spiritual awareness less than we need help to develop it! These horoscopes present a lot of in-form-ation. Practise the art of sweeping your eye down the page—up the west, in the direction the planets revolve—against the current of the Earth’s rotation, against the chronological order of the houses, and against the tempo of our emergence into relationships each day. 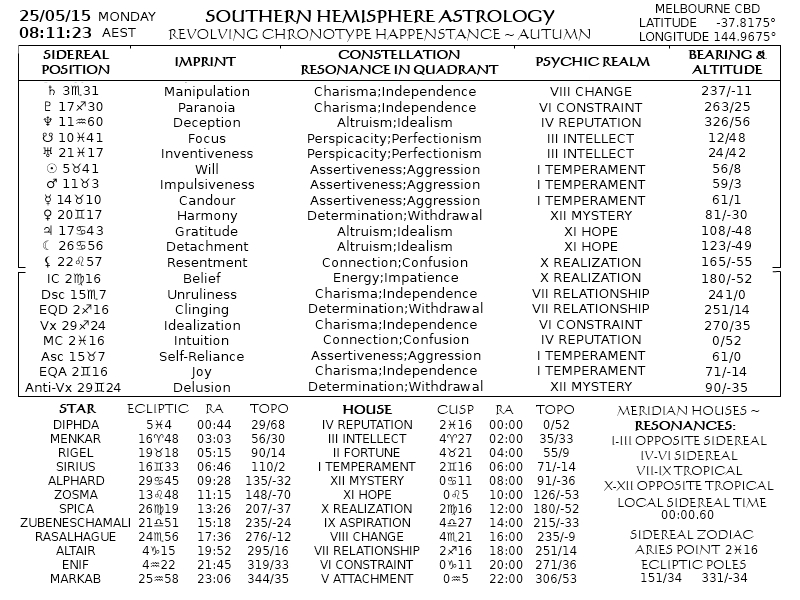 By the time you move clockwise into the personal eastern half of the chart, you may be seeing your identity for what it is! I am coming to believe not only that the season of your birth does imprint itself on your development, but that the time of day does too. I am noticing in myself a vitality which waxes and wanes, and with it my creativity, my mood and my attitude. 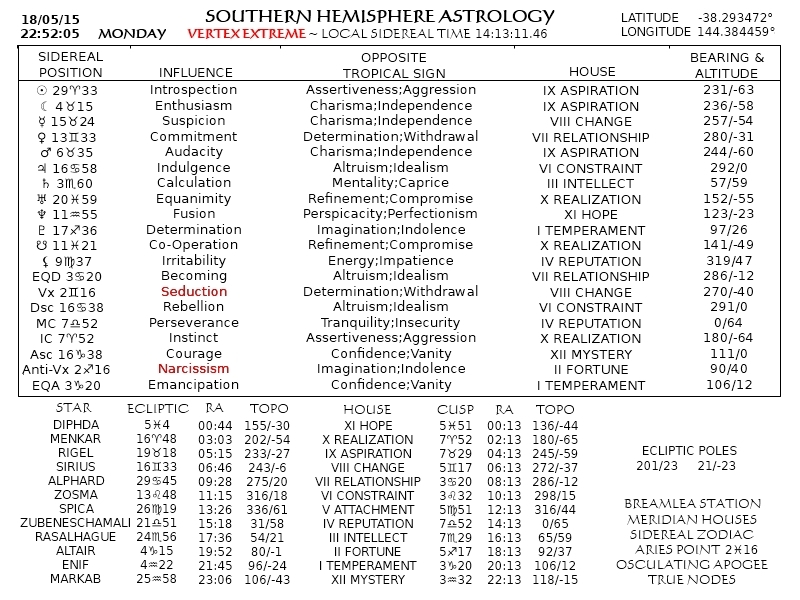 There is not much difference between the four Chronotypes in terms of planetary positions, but as you read down from ninth to twelfth house as I have suggested, you will find four unique orientations. Which is yours? In football parlance, you would say there is no way he’ll be there in September. How much penetration will he get with a line-up like this? In fairness, nothing is harder than advocacy, as every brave, under-appreciated politician will tell you. Persuading people it’s ok to be wrong might clear the ball from defence, but getting possession in the forward fifty will not happen by argument. That requires the finesse of a whole team enjoying itself. This one looks like playing the season up the other end. Idealism and proselytism are in the air on Winter’s cusp, as witness your discomfort with my non-tropical, non-IAU Sun position. If we must share cosy spaces, let’s push each other around. 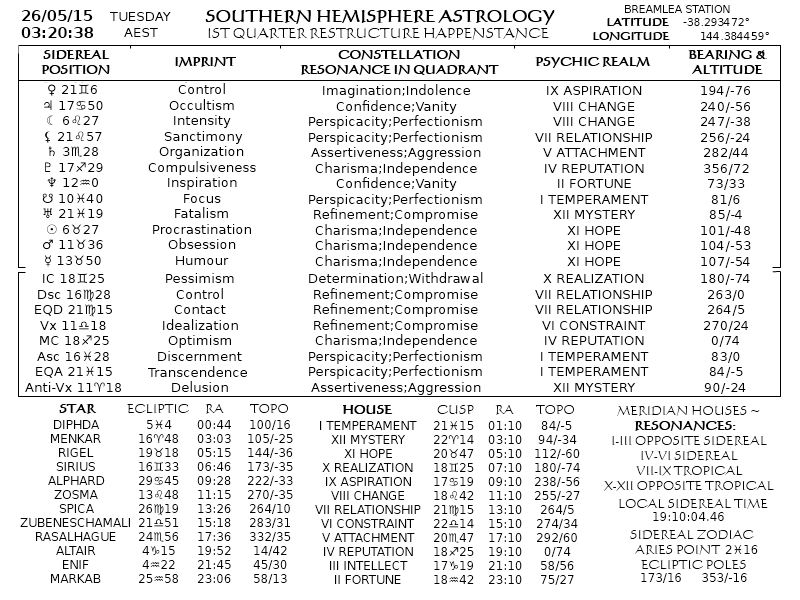 The Sun in tonight’s chart is 1.5° from Taurus, which it will enter at 10:17 on Tuesday, but does this really mean anything? Where is the boundary of Taurus? Where is yours? Taureans aren’t born when the Sun is in Taurus, or are they? 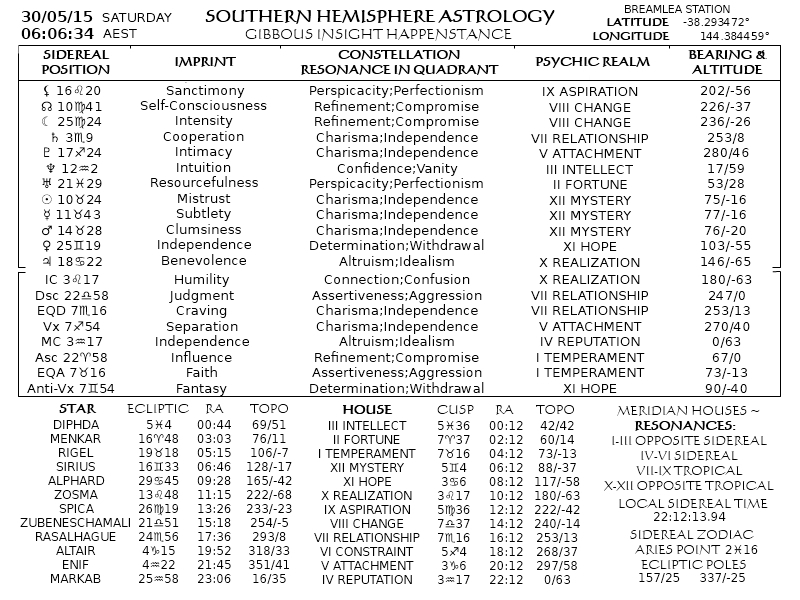 Southern Hemisphere Astrology horoscopes do not aspire to predict the future, define a personality or describe a universe. They might do a little of all those things, but they have only one purpose, to open your mind to its self. 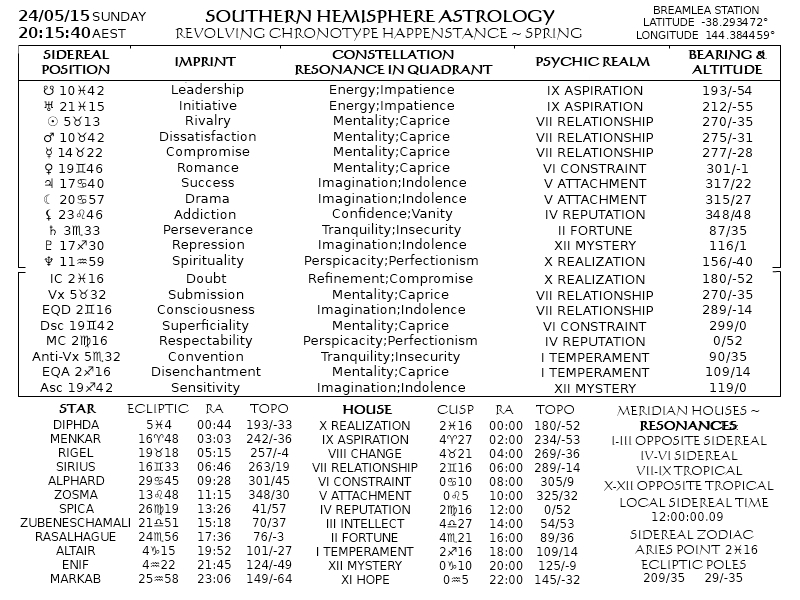 Just as a satellite image can identify concentrations of traffic or garbage or water vapour, SHA sees a horoscope as a heat-map of recent and ongoing concentrations of activity in the self which it may not have been conscious of as related to each other. The contents of the sky are a web catching flies. A spider knows what they are and where they are from the imprint of their struggle to escape. Tomorrow’s flies die in the burning calories of today’s, at a particular destined moment in time. Spider, web, fly: keywords. You could get fanciful and add wind, rain, garbage, bird, hair. It’s your story. The Vertex is the self as other, the spider as fly in her own web, the end of the pendulum swing. It reaches its highest altitude when it is occupied by the Summer Solstice, and its lowest point beneath the horizon when it coincides with the Winter Solstice. A look at these two moments on Monday demonstrates two different, probably incompatible, personalities, and they can be identified by the heat-maps of two meditations, irrespective of Sun position. 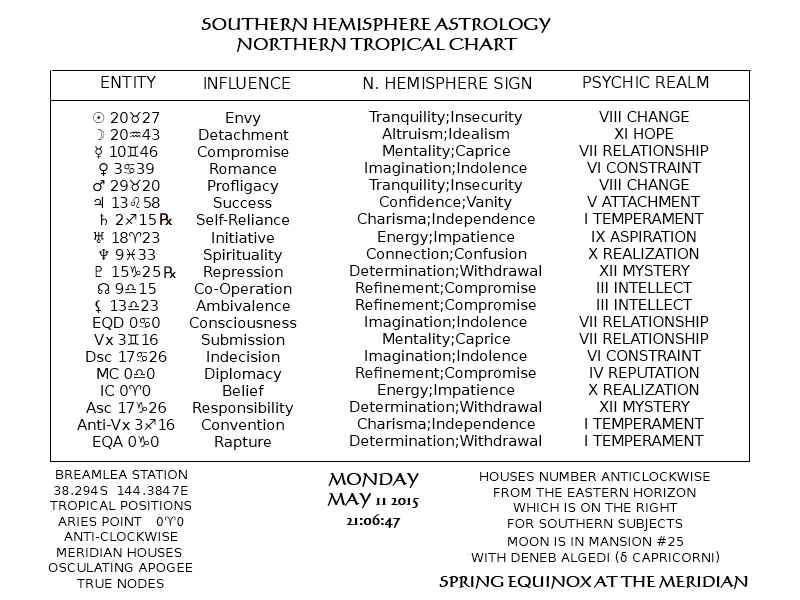 As indicated, this chart gives conventional tropical positions and resonances, but houses are renumbered. 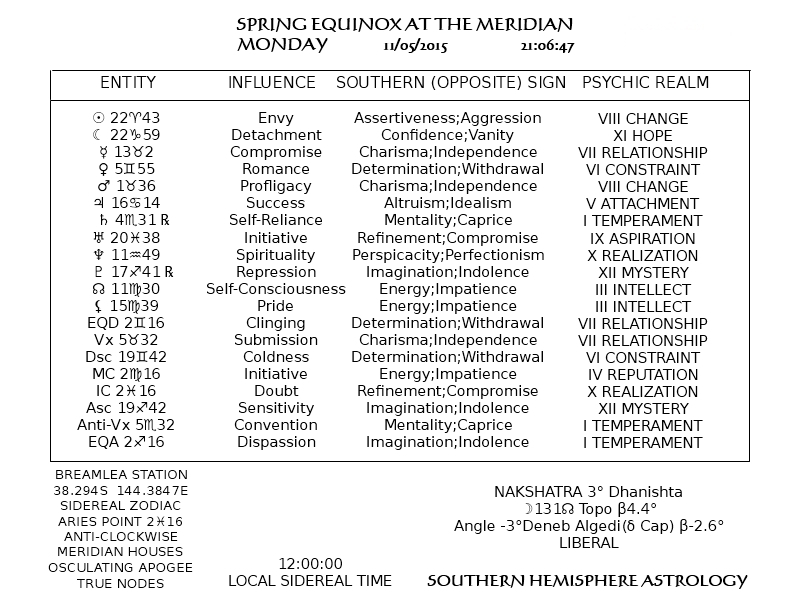 With the adoption of Meridian houses, two new angles appear, and I think it wise to suspend play with resonances by quadrant. 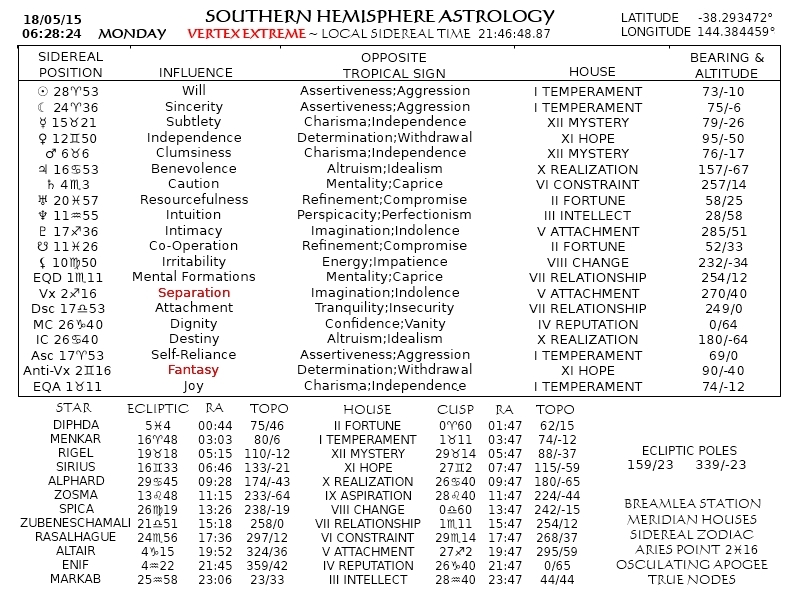 And do note the horizontal positions on the new horoscope wheel! More on houses during the week.